Based on reviews from 225 experts and 29,196 users. Learn how our rankings work or see our guide to beige running shoes. Updated Apr 2019. Why do we love the color beige? Beige may not be one of the more popular primary colors, and not a lot of people say that beige is their favorite, but it is one of the classics. It’s a color that simply will not be forgotten by time. This is the reason why it has been a staple in the industries of interior design, product creation, beauty, skin care, and fashion. From an aesthetic angle, the color beige is flexible - it goes well with almost any color. So, it isn’t hard for a person to mix and match beige running shoes or clothing items with others in their wardrobe. Not only is it flexible, but designers consider it as a grounding color, acting as a base and allowing the other colors to be in the foreground. Beige is also one of the colors of nature. From the warm beige sands on the shores of a beautiful beach to the delicate hue of a beige pearl and the elegance of a tea rose flower of the same shade, almost all of the beiges in nature make us feel calm and relaxed. Who wears beige running shoes? 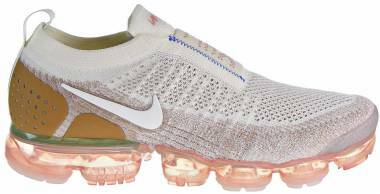 Those who prefer beige shoes for running are into, both, functionality and fashion. They want something that can be used for running or going to the gym. At the same time, they also want beige running footwear that’s fashion-forward and street-ready. Yes, beige can be a boring color to most, and it is true that those who gravitate towards everything beige can have a reserved personality. However, those who prefer it can also be reliable with a downplayed kind of confidence, never wanting to be the center of attention, but they still want to be noticed. Other characteristics linked to the preference of beige running shoes are: minimalistic, uncomplicated, and chic. Many beige running shoes border into the lifestyle sneaker department because of the versatility and chicness they exude. 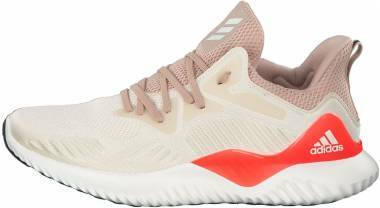 For example, the Alphabounce Beyond has a colorway that has a pinkish shade of beige for both the male and female version. It will look great when running through the park or when doing some lifting at the gym. It also won’t look half as bad when sported as a casual, daily sneaker. 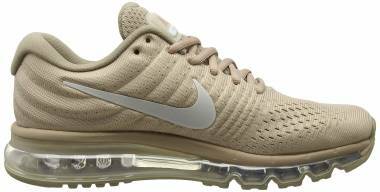 There are also running shoes that have the color beige as an accent color. Beige is usually paired with both muted colors and vibrant ones. A good example of a beige accent on a running shoe is the overlay on the Nike Free RN 2017 for women. The trademark Nike logo is in beige with a pinkish undertone. The Under Armour SpeedForm Slingride TRI for women also has a similar version, with one colorway having a grey upper with warm accents of sandy beige, and their trademark logo in the same color as an overlay. Of course, men aren’t to be outdone when it comes to a beige running shoe. The Adidas NMD_XR1 is a stylish shoe, with one colorway having a beige theme. Meanwhile, the Adidas Ultra Boost has plenty of colorways that use beige as the main color and as an accent color. One of the main things to remember with beige running shoes for men is that the undertone of the color is commonly darker and cooler compared to the shade of beige used in female running shoes. The reason behind this is cooler and darker tones gives off a more masculine vibe. 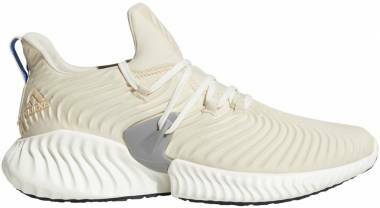 Now that we know the basics of the color beige, as well as beige running shoes, let’s check out quality picks from RunRepeat.com. 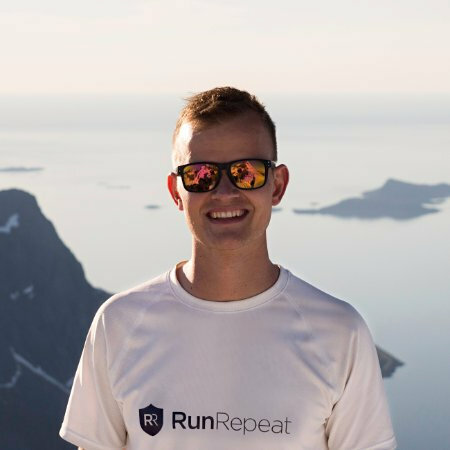 Before we go to our list, remember that at RunRepeat, we spend around 15 to 30 hours collecting reviews, so you don’t have to go through each one when you look for a pair of your own. The responsiveness and cushioning the Nike Air Zoom Structure 21 delivers is more of the same from the previous version. However, it has received upgrades to make it lighter and more comfortable to wear while it provides moderate support. For those who are already fans of the Air Zoom Structure 20, this stability road running shoe is something to check out. With a seamless upper, the Gel Quantum 360 Knit provides runners a sock-like fit without compromising breathability. The responsiveness and cushioning are exceptional thanks to the 360 Gel Technology on the midsole. Plenty of users were impressed with the quality the shoe possesses while others felt that the shoe was a bit heavy and narrow. Despite this, it still proved to deliver a reliable ride. The Adidas AlphaBounce has proven to be a dependable companion for both running and walking. This neutral road shoe brings reliable, springy, and flexible cushioning combined with an upper that feels secure, protective, and comfortable. There are also plenty of colorways to choose from, not just beige. The Adidas Ultra Boost is a shoe that needs no introduction. It has received plenty of praises because of its stylish appearance, durability and midsole responsiveness. The majority of runners who have tried it said that it felt comfortable throughout their usage. There were those who felt that the shoe was a tad expensive. Nonetheless, many were still willing to invest because of this neutral shoe’s quality. The Nike Air Zoom Vomero 13 has garnered plenty of positive reviews from runners and consumers alike. Its eye-catching design, comfortable midsole, and traction-ready outsole was the highlight of most of the reviews. There were a few who thought that the forefoot was a bit narrow, but the negative feedback didn’t overshadow the shoe’s popularity. This road running shoe was made for neutral runners. The responsiveness and comfort it brought were welcomed by many. Its soft cushioning and smooth heel-to-toe transition were considered to be a premium experience by most users. In short, the New Balance Fresh Foam Cruz has been deemed a shoe that has the perfect combination of performance and great looks. Another pick from New Balance that has both a beige theme and beige accents is the Fresh Foam Arishi. This neutral running road shoe was designed with comfort, functionality, and style in mind. The Fresh Foam cushioning technology and its breathable upper makes it a great choice for those looking for affordable footwear that delivers performance but can still be used as a daily sneaker. The most basic colors – black, white and grey – will look great paired with a beige running shoe. With this combination, you’re going to look minimalistic and stylish, especially when the clothing items you’re wearing don’t have any print on them. On the other hand, if you’re going to wear prints, what’s going to look great is if you make them as an accent. For example, a printed top will go well with a plain, black, grey or white jeans, and beige running shoes. If you’re going to wear printed bottoms, then make sure you’re wearing a plain top. If you’re into wearing pastel colors, then you’ll find beige running shoes very attractive. Anything pastel will work just as well as black, grey or white because they are all muted colors. Similarly, you can pair plain clothing items in pastel colors with beige to look clean, elegant, and simple. Mix and match it all you want. Lastly, if you’re looking at pairing your beige running shoes with vibrant colors, you have to consider beige as a stabilizer. For example, a dark, vibrant blue will go elegantly with beige running shoes. Other vibrant colors that are stabilized by beige are orange, red, and deep purple. Any color can go well with your beige trainers, but you have to remember to balance your outfit out. If you have two clothing pieces that are eye-catching, and then you sport your beige running shoes, it might not be as good of a combination. Even though beige is a grounding color itself, make sure that your outfit only has one item that’s the center of attention. The main difference between a road and trail running shoe is in the features. Road shoes were designed to meet a runner’s needs while on concrete, asphalt, or other common surfaces. The outsole provides just enough grip for the runner to have balance and traction. A trail shoe, on the other hand, has an outsole that’s more robust because it was meant to conquer harsh conditions during a trail run. The midsoles on road shoes typically focus on responsiveness and cushioning while the ones on trail running shoes may have an extra plate of protection, so the underfoot is safe from sharp or blunt objects on the trail. As for the upper, both road and trail shoes can have breathability. But, on other trail shoes, the upper might be water-resistant or waterproof - a feature that isn’t normally found on road running shoes. Why isn’t beige a popular color in trail running shoes? 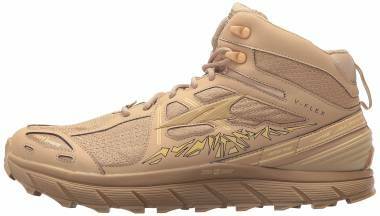 Not a lot of trail shoes have the color beige on it and for a good reason. Trail shoes need to be attention-catching. Most of the time they come in bright and vibrant colors, so runners are easily spotted while running on the trail. Some have dark uppers, and that’s most likely to mask the color of dirt that will potentially get on the shoe. The dark color makes the grime less noticeable. There are so many factors to think about when it comes to the right road running shoes for you. First, however, you need to think about your needs. Do you want something breathable or waterproof? What are you going to use your shoes for? Once you’ve figured out the answers to all of these questions, you can figure out the factors to think about. Essentially, you’d want to consider price, usage, features, and looks. How long will my beige running shoe last? The shelf life of your beige running shoe will depend on how you’re going to use it. If it’s purely for daily wear, and then the activities you do are not so rigorous, it’s going to last longer than when you’re going to use it for running or training. Your foot’s arch is the curved part under your foot. There are three types: flat, normal and high. The higher your arch, the more your foot will roll inward. This action is called overpronation, and it could cause injury to runners. To correct this action, a stability shoe is needed. When you have flat or normal arches, you can opt for regular shoes. To know more about arches, read this RunRepeat Arch Support Study.